The production of blood cells is regulated by so-called hematopoietic stem cells (HSCs), which reside in bone marrow. It is known that under certain stress conditions, such as aging or inflammation, the HSCs' self-renewal capacity — a key property of stem cells — decreases. Now, a team of researchers led by Yuko Tadokoro and Atsushi Hirao from Kanazawa University have studied the role played by a molecule called Spred1 in the homeostasis (equilibrated self-renewal) of HSCs. Their main finding is that Spred1 safeguards HSC homeostasis in mice subjected to a high-fat diet. The researchers looked at Spred1 protein because it binds to c-Kit, a molecule involved in signaling processes that govern HSC development and regulation. Experiments with Spred1-deficient mice showed that the protein is not crucial for normal hematopoiesis (the formation of the cellular components of blood) in stress-free situations. Furthermore, Spred1 deficiency promoted HSC self-renewal, resulting in prolonged cellular lifespan, increased competitiveness and better resistance to physiological stress. Tadokoro and Hirao also used Spred1-dificient mice as a model for Legius syndrome, a pathological condition caused by mutations in the Spred1 gene. They found that Spred1 deficiency does not lead to the development of leukemia, and concluded that the protein is therefore not a conventional tumor suppressor. In wild-type mice, aging, transplantation and treatment with lipopolysaccharide (a procedure mimicking bacterial infection) upregulated Spred1 protein. The scientists suggest that this upregulation may lead to HSC dysfunction in conditions of physiological stress. However, when the researchers looked at the effect of a high-fat diet on Spred1-deficient mice, they found that the diet triggered the development of a particular type of blood cancer. This finding clearly demonstrates that Spred1 does play an essential role in regulating hematopoietic homeostasis. 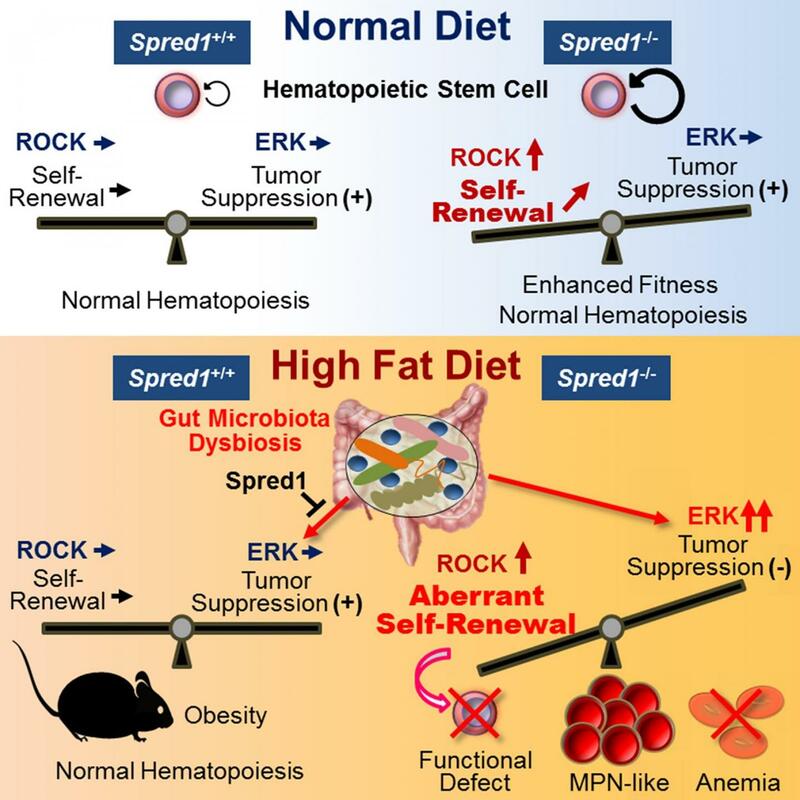 The study of Tadokoro and Hirao highlights the complex relation between Spred1 and hematopoiesis, and establishes a link between the function of the protein and dietary stress. Regarding future research, the scientists conclude that "investigation of the pathophysiological roles of dietary factors in stem cell self-renewal, and exploration of approaches that manipulate Spred1-mediated control of HSC self-renewal, may uncover innovative technologies for preventing diet-related diseases and malignancies." Hematopoiesis is the process of the formation of the cellular components of blood. All blood cellular components are generated from hematopoietic stem cells (HSCs). HSCs reside in bone marrow, and can differentiate into all types of blood cells (red blood cells, lymphocytes and myeloid cells). When they differentiate, some of the produced cells are again HSCs, so there is always a supply of HSCs — the self-renewal process. Yuko Tadokoro and Atsushi Hirao from Kanazawa University have studied the relationship between a protein called Spred1 (sprouty-related, EVH1 domain-containing protein 1) and the self-renewal of HSCs in mouse models. On the one hand, they found that under normal conditions, Spred1 acts as a negative regulator for HSC self-renewal, while on the other hand, in a situation of diet-induced stress, it safeguards hematopoietic homeostasis. Legius syndrome is a condition resulting from mutations of the Spred1 gene; symptoms include freckles, learning disabilities and attention-deficit hyperactivity disorder (ADHD). It is often confused with neurofibromatosis type I (NF-1). In the latter, tumor growths are common, whereas in Legius syndrome they are absent. Tadokoro and Hirao investigated the connection between Spred1 deficiency and Legius syndrome and found that Spred1 does not play the role of a conventional tumor suppressor.